God had a reason for recording the story of Jesus and Peter walking on water. What lessons can we learn from this story of faith, doubt and miracles? More than 5,000 people had followed Jesus Christ to a deserted place on the shore of the Sea of Galilee. Jesus cared about them deeply. He healed people; and when they were hungry, He did another miracle. He fed all of them with just five loaves of bread and two fish (Matthew 14:13-21)! Then Jesus sent His disciples on ahead while He said goodbye to the thousands of people. He told the disciples to get in their boat and go to the other side of the Sea of Galilee (verse 22). After the people left, Jesus went up on the mountain to pray. While Jesus was praying, His disciples were struggling against a powerful headwind. Many of the disciples were experienced fishermen, but they were straining to make headway against the wind. Seeing the plight of His closest friends, Jesus went to them (Mark 6:48). To do this, He defied the natural laws of physics. He performed the amazing miracle of walking on the water (Matthew 14:25)! During “the fourth watch of the night”—which would have been in the last few hours of the night prior to daylight—the disciples saw Jesus walking toward them on the water (verse 25). Not realizing who He was, they cried out, “It is a ghost!” (verse 26). They were terrified of the figure approaching them in the middle of the sea. “But immediately Jesus spoke to them, saying, ‘Be of good cheer! It is I; do not be afraid’” (verse 27). Peter’s fear quickly turned into awe and action. He said, “Lord, if it is You, command me to come to You on the water” (verse 28). Jesus said, “Come,” and Peter took a step out of the boat without sinking (verse 29). With faith in Jesus Christ, Peter started walking on the water toward his Master. But then the strong wind took his focus off of Christ. Soon doubt started forming in his mind. 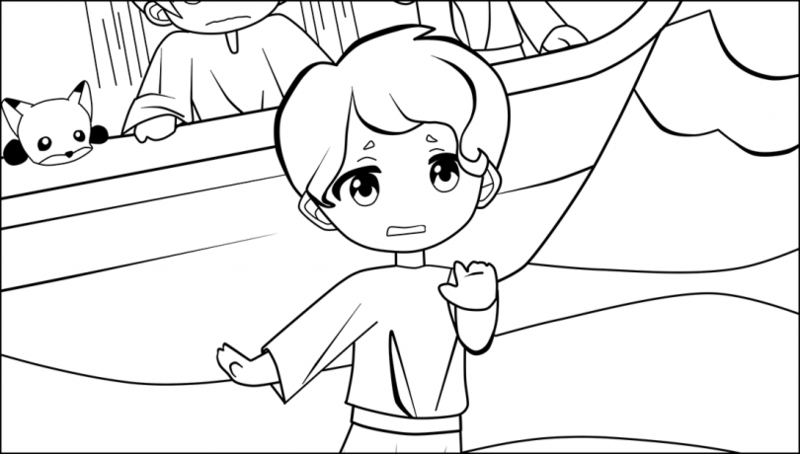 With his faith in Christ shaken due to the howling wind, he started to sink into the sea. As he was sinking, Peter called for Jesus’ help. Jesus immediately stretched out His hand and caught him. As He did so, Jesus asked Peter, “O you of little faith, why did you doubt?” (verse 31). After they got into the boat, the wind that had been so boisterous suddenly stopped (verse 32). We need faith. Faith is a strong belief in God and trust that He will do what He said. Without faith it’s impossible to please God (Hebrews 11:6). The Bible provides many examples of faith, including the examples of Christ and Peter. In John 5:19 Jesus declared that He could do nothing by Himself, but only through God the Father. Jesus walked on water because of His faith in God. Likewise Peter walked toward Jesus in faith before he stumbled. We need the living, true faith that allowed Jesus and Peter to walk on water. Doubt destroys faith. When Peter started to sink, Jesus said the problem was doubt. Doubt damaged Peter’s faith to the point that he couldn’t walk on water anymore. Doubt can also damage our faith. Faith is tied to the promises that God gives us. Once we start to doubt those promises, then our faith starts to fail. Jesus is there when we face trials. In the midst of the waves and the wind, Jesus was with Peter and prevented him from sinking. This is a reassuring lesson that helps to boost our faith. Today Jesus Christ does not walk as a human on the earth next to us, but He is still in charge and able to give us a helping hand, whatever problems we may face. The apostle Paul explains how God helps us through trials. He said, “No testing has overtaken you that is not common to everyone. God is faithful, and he will not let you be tested beyond your strength, but with the testing he will also provide the way out so that you may be able to endure it” (1 Corinthians 10:13, New Revised Standard Version). Whenever life tosses a storm our way, we can call on Jesus Christ. He will be there to offer a hand to help us get back on our feet. Faith is a big subject, and it goes beyond believing in God’s miracles and trusting in Him during our trials. The Bible says we are saved by faith—our sins can be forgiven and we can receive eternal life because of the faith God gives us (Ephesians 2:8-10). We can’t work this faith up, but we can ask God for it and exercise it by always doing what God says. If we don’t obey God and live His way, our faith is dead (James 2:14-26). We should always be ready to step out in faith to obey God—to have living faith. While the story of Peter walking on water ended when he got back in the boat, Peter’s spiritual education and development continued. He did stumble a few times, such as when Jesus was arrested and Peter denied even knowing Jesus. But in the end, Peter was able to get back up and continue walking in faith. Peter grew to become a leading figure of the Church. Years later, Peter summed up the lesson that he learned in part on the Sea of Galilee with Jesus Christ that windy night. He said that trials help prove “the genuineness of your faith, being much more precious than gold” (1 Peter 1:7). This precious faith will be rewarded with “praise, honor, and glory” and incredible happiness that will last forever (verses 7-9). As Peter learned, trials can make us begin to doubt God and His promises. At times like that, we must ask God for help and keep the faith!